UPDATED: Now for Windows 10 too! 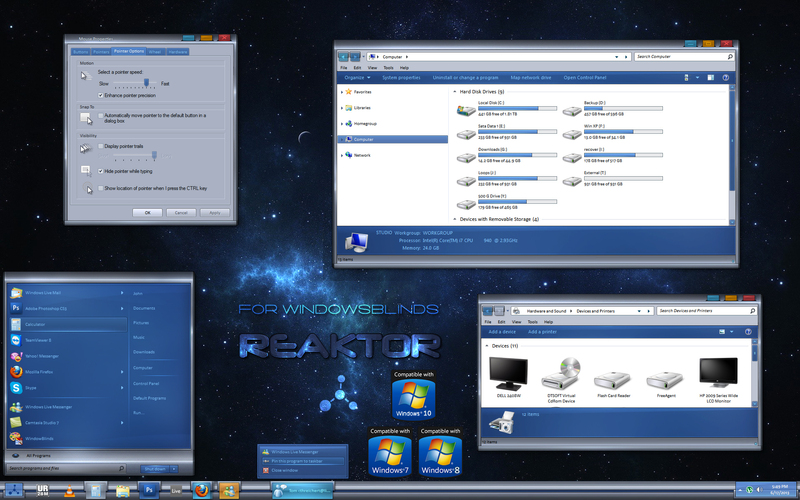 I'm happy to have updated my Reaktor theme for Windowblinds. I spent a long time on this thinking of an idea I hadn't seen done before, then building on it as imagined. I hope that this concept is appreciated by all, as it's certainly one of my favorite themes, and was very challenging to complete. Thanks to all who help test and those who make matching skins, which should be in the galleries. I also will be making some walls and maybe a dock, look out for those. That said, I hope every one enjoys Reaktor for WB! Works on Windows 7, Windows 8 and now Windows 10 also. This is one of the best skins ever! Veru useable, clean and concise, and beautiful to boot! Another vote for best ever!!! Thanks John!!!! RedneckDude, all it needs now is one of your awesome cursors to go with it! also as seen in this screenie... link.. This is a great skin - everyone should buy it and support the designer. Lol wow kiss up much. Very nice yes but best ever no, best you ever did not even. Oh sorry was I to lie here? Really nice friends you have that wont tell you the truth. Please you guys do this for ever skin people try to sell just to get money. Worth the money .. if you think it is then it is. sigh ^... the hell is wrong with some people?